Ahh the summer holidays – in our family that usually means a flurry of ensuring passports and doggy jabs are up-to-date,car packing (and re-packing), organising maps, itinerary, hotel bookings and ferries or tunnels to not miss for our long-haul continental drive – in short, it’s a lot of stress! That was until the idea of a ‘staycation’ landed and so we found ourselves – the whole family including dog, husband & teen – together in one car headed for a long weekend in Hampshire at the Sandy Balls holiday village. Unique for more than just its name, Sandy Balls is a truly dog-friendly spot set in the lush New Forest. Contrary to what its name suggests, there isn’t in fact any sand but the name harks back to the reign of Henry VII where ‘sandyballas’ described the dome-shaped outcrops of sand and gravel on the western boundary of the site. History lesson aside, unfortunately thanks to a combination of sat nav, husband’s directions and an accident on the M3, we didn’t arrive until late in the evening but Sandy Balls was luckily easily found under a starlight canopy and thankfully the warden was still there for us to check in. Our Laid-Back Lodge wooden cabin was exactly that; spacious and welcoming with an atmospheric instant fire and smelling as wonderfully woody and pine-y as the air outside. Whilst the furry one scampered and explored, we made ourselves at home in our spacious 2-bedroom cabin. 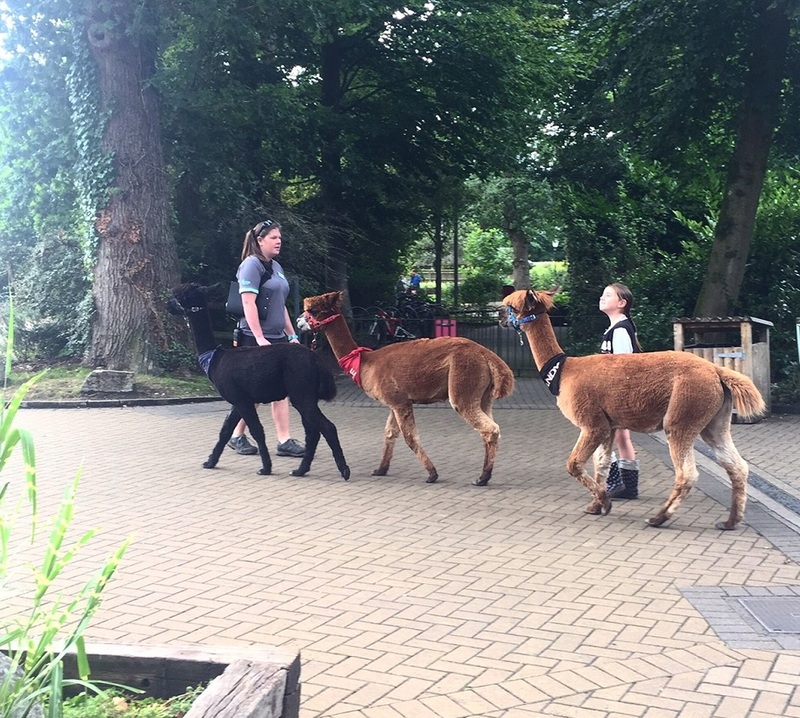 Yup you can go on an Alpaca Walk! If you want there’s plenty of action and adventure to keep the kids entertained, from zorbing to bird-of-prey encounters, laser and Nerf games to clay and craft workshops, treasure hunts to dancing and music. Plenty of options for both indoor as well as out. As sociopaths go, my family did well on their first ever ‘mixer’! It was fun to join in the throng but also nice that we could keep a distance when preferred. Conveniently, the village also has a shop, restaurants and pub, as well as lots of places to relax and enjoy the atmosphere. A great bike hire shop will kit you and the family out with hover boards, scooters and doggy-trailers etc, so there is no excuse for the kids to not be active. 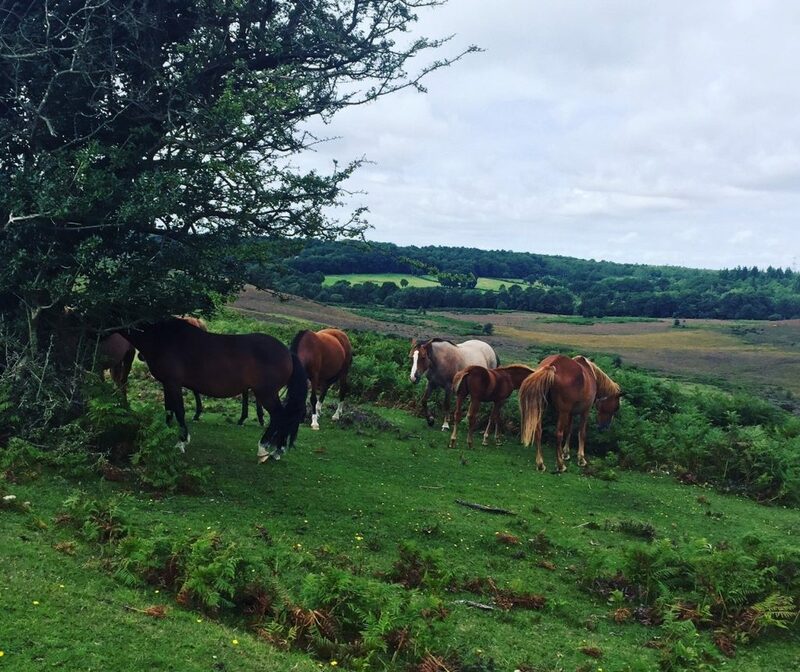 We were bowled over by the beauty of the New Forest region, whilst the local beer and cider selection went down oh so well after that 10 mile bike jaunt through the forest…! Of course as we also found, there is loads to explore on foot in the forest too if two wheels aren’t your thing. 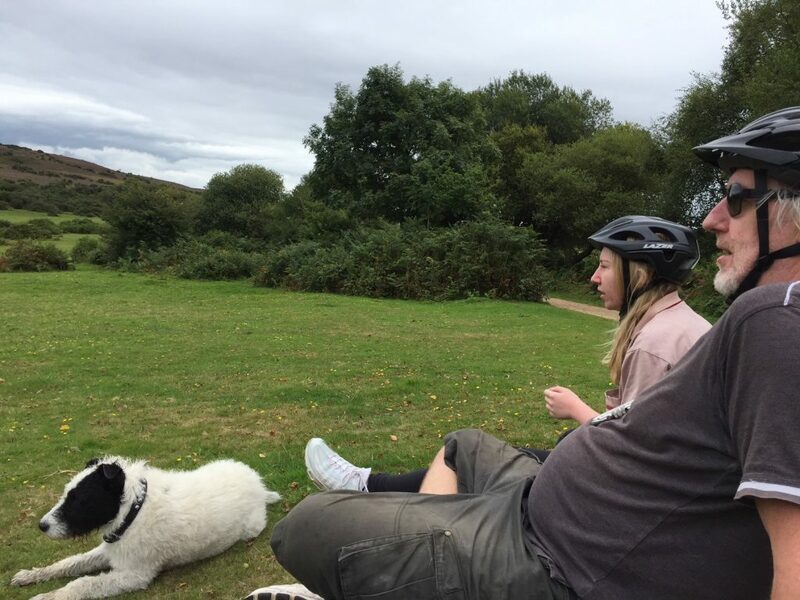 Taking a rest and absorbing the scenery on our bike ride! All in all we loved our staycation and would think better of venturing far away in the future in favour of somewhere like Sandy Balls and its Hampshire setting. So whilst we said ‘bye’ to the wild ponies, donkeys and pigs of the New Forest, we sense that we will be back again soon – the furry one sits expectantly by the door as the forest beckons!